Happy New Year! Bonne Année 2019! We were delighted to see Christine Harvey and her brother here over Christmas. Christine is making an excellent recovery from back surgery and it was so good to see her looking well again. We were blessed to have some beautiful flower decorations done by her for the church. It was great to see Ella Dyer here for much of December. She flew back to the US on Christmas Day to share the day with Jody, her husband. She’ll be back in Nice later this month. Congratulations to Dami and Flor Coker on the birth of their daughter, Maia Olukemi. Congratulations (a little belated) to Barclay and Tucker, the sons of Shannon and François Simon, who made their debut as acolytes on Advent Sunday. We hope they will be able to serve as acolytes again soon. We welcome Dalton and Sheila London from Canada, here for their annual trimestre. It’s so good to see them again after ill health prevented them from visiting last winter. We have a Reception in the hall after the Eucharist on Sunday to celebrate the ‘landmark’ birthdays of Frank Slaymaker and Tom Tennant: many happy returns to them both! The vast majority of Christians celebrate the feast of the Epiphany, which this year falls on a Sunday. However, the Western and Eastern branches of Christianity celebrate differently. The three kings have now reached church crib scenes. But if you look at the words of Matthew’s Gospel from which the story comes, there aren’t any kings, just three gifts: gold, frankincense and myrrh. It’s the number of the gifts that gives rise to the idea of three wise men (Greek: μάγοι, magoi). Magi appear first in Persian culture about 600 years before Jesus’ birth. They were religious experts, scholars who advised kings, performed religious rituals, observed the stars and interpreted dreams. The Magi of Matthew’s Gospel aren’t described as ‘kings’ until about 500 years after the birth of Jesus. This fulfills the prediction of Psalm 92 that ‘The kings of Tarshish and of the isles shall pay tribute; the kings of Sheba and Seba shall bring gifts. All kings shall fall down before him;’ and Isaiah 60: ‘Nations shall come to your light, and kings to the brightness of your dawn.’ Both texts are set to be read with Matthew’s Gospel at Epiphany. By the sixth century, these kings had acquired names and descriptions. Caspar, meaning ‘treasurer’ was imagined as a beardless young man. Melchior, meaning ‘king of light’ was imagined as a bearded old man. Balthasar, which means ‘God protect the king’ was portrayed as dark skinned. By the eighth century, the Magi had come to represent the three continents of Asia, Africa and Europe – the whole of the then known world. These developments of the story were not arbitrary. The whole point of Matthew’s account is to show that Jesus is of significance to the whole world. Later additions to the story simply amplify its main point. The gospels aren’t written as biographies of a remarkable man: they are written to ‘make a point’. The evangelists (gospel writers) intend to persuade their audience that Jesus was the Messiah and Son of God and that his birth, life, death and resurrection are of life-changing importance to humanity. So far during this Christmas season, we have heard the birth stories from Luke’s Gospel, with his story of the shepherds and the angels. This stresses that God’s Son is born in humble circumstances and his birth is first witnessed by ordinary people (shepherds). Luke’s Jesus is born into ‘real life’. We also heard the Prologue from John’s Gospel which begins by portraying Jesus as the person who, as ‘the Word’, was both with God the Father at the creation of the universe and ‘made flesh’ as Jesus Christ. The Prologue also stresses that only some can accept who he is; others will reject him. 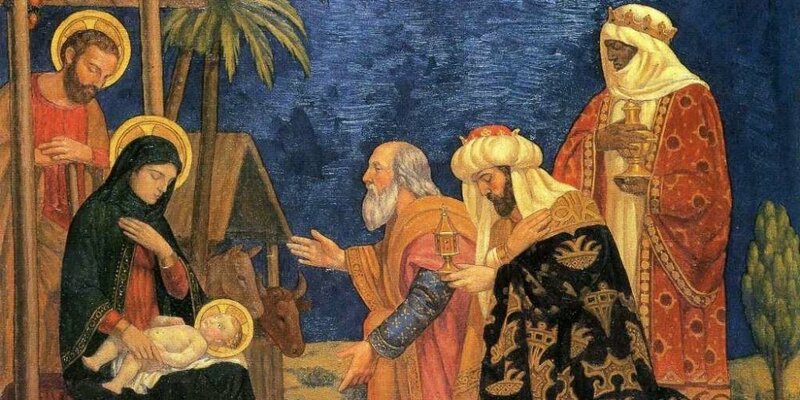 Now, for the Epiphany season, we turn to Matthew’s Gospel which introduces Jesus receiving the attention and homage not of shepherds but of foreigners, Magi who are guided by a star to see Jesus. For them, the appearance of Jesus is a manifestation of God (an Epiphany, the Greek word which provides the name for the festival at the end of the Christmas season). Moreover, through coming from outside the Jewish world to which the shepherds of Luke belong, they show that Jesus belongs to all people, that he is the Saviour of all people. They also bring gifts which in a shorthand way show who Jesus is and what he will become. Although he is a baby, they bring him gold – the symbol of kingship – and frankincense, the symbol of worship. The myrrh – used to anoint the dead – points to the weight of sadness and suffering that this baby will bear as an adult. We can share the recognition of the Magi. We should recognize that Jesus was born to make God known to us and to save us – nothing can ever be the same again. Each individual life is valuable to God and he will give us resurrection life after this life. This changes the way we view our lives now and it changes what we look forward to. For each of us it is a revelation, an Epiphany. The Orthodox tradition focusses on the baptism of Christ at Epiphany, rather than on the visit of the magi. In the Western Calendar, we celebrate Christ’s baptism in Epiphany tide rather than on the day itself. At his baptism, God reveals that Jesus is his Son: “You are my Son, the Beloved; with you I am well pleased.” In this moment, God as Trinity is disclosed: Jesus Christ, the Son of God is in the waters of the Jordan, the voice of God the Father is heard, and the Holy Spirit, signified by a dove, descends. This revelation of God as Trinity, when all of creation is illuminated by the sanctifying presence of God, is the reason for the feast’s popular name, ta Fota (the lights). Since Christ’s baptism in the Jordan is commemorated at Orthodox Epiphany, water plays a central part in the sevrices. On the evening before January 6, there is a service of the Lesser Sanctification of the Water. Priests then take the blessed water to bless people and their homes. The principal event of Epiphany itself is the Great Sanctification of Water. The priests and people go to the nearest body of water -– sea, lake, river, even water depots – to bless the water. As part of this liturgy, the bishop or priest casts a cross into the water and a dove, symbolising the Holy Spirit, is released. 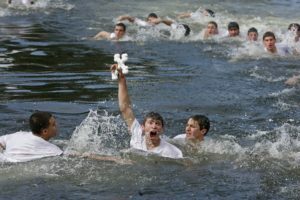 Young men then dive into the water to retrieve the cross. The one recovers the cross returns to the priest to receive a special blessing, which is believed to confer the prospect of good fortune in the year ahead.